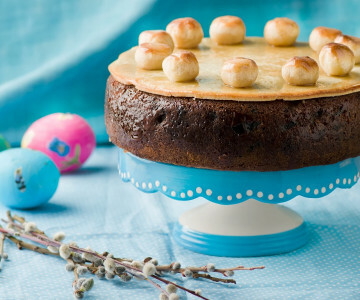 A star of the show at this time of year, one recipe to perfect for Easter is Simnel Cake. Eaten since medieval times, the cakes are often associated with Easter time. Originating from a custom where girls in domestic service would gift the cakes to their mothers (for Mother’s Day), the cake would not be eaten until Easter Sunday. Around this time of year, food stores were typically quite low, and so the high-calorie, sweet Simnel cake was the perfect option! After a demise of domestic service after the First World War, the Simnel Cake began to be associated with Easter in its own right – with the eleven marzipan balls representing Jesus’ disciples. Here is our go-to recipe for the perfect Easter dessert – click through the links to stock up on your ingredients! Preheat the oven to 150 degrees C / 280F / gas 2. Using baking parchment, line the base and sides of a 20cm round deep cake tin. Cut the cherries into quarters (they can be rather sticky), add to a sieve and rinse under running water. Drain VERY well and then dry using kitchen paper. Place the cherries in a bowl with the butter, sugar, eggs, self-raising flour, sultanas, currants, candied peel, lemon zest and mixed spice and beat well until thoroughly mixed. Pour half of the mixture into the prepared tin. Take one third of the marzipan and roll into balls. Place these onto the top of the cake mixture. Spoon the remaining cake mixture on top and smooth out the surface. Bake in the pre-heated oven for about 35-45 minutes, or until the mixture is well risen, evenly brown and firm to the touch. If the top is browning too quickly then cover with aluminium foil. Leave to cool in the tin for 10 minutes. When the cake has cooled, brush the top with a little warmed apricot jam. Roll out half of the remaining marzipan to fit the top of the cake. Press firmly on the top and crimp the edges to decorate. Brush the marzipan with beaten egg and arrange the marzipan balls around the edge of the cake. Brush the tops of the balls with the beaten egg and carefully place the cake under a hot grill until the top is lightly toasted. Alternatively, glaze using a blow torch!